Will provide enough supplies for 2 people for 3 days after a major earthquake. (2) Thermal Blankets – Designed by NASA to retain body heat! (2) Ponchos with hoods – Don’t be caught in the rain. (2) Tissue Packs – Help maintain sanitary conditions. (1) Pair Work Gloves – Heavy duty with leather palm. (1) Tube Tent – Comes with rope and instructions. (50) Water Purification Tablets – to purify unsanitary water. (2) Dust Masks – Prevents dust and germ inhalation. (2) Pair Vinyl Gloves – Protect hand from infection. (1) AM/FM Solar Radio – Flashlight with generator. 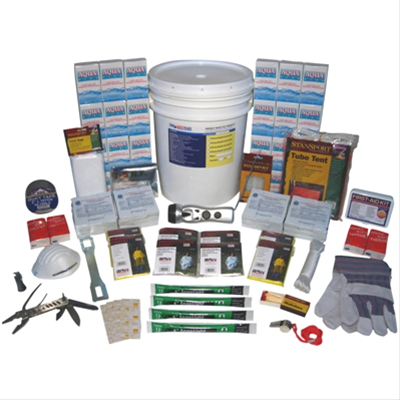 (1) 52-piece First Aid Kit – comprehensive first aid kit. (2) 12 Hour Lightsticks – bright green light at the snap of a finger! (1) Can Opener – Easy to use GI style can opener. (1) Nylon Cord – 50 feet of heavy duty nylon rope. 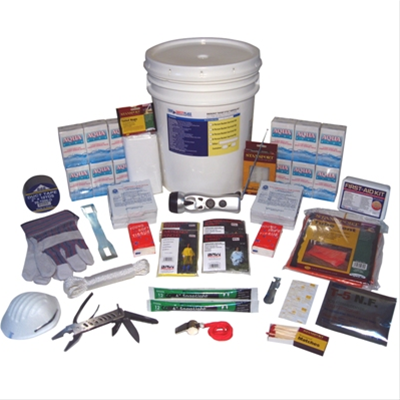 (1) Gas Shut-off Wrench – protect your home from explosions. (1) Multi-function Swiss Army Knife – 5 function folding knife. (1) Box Waterproof Matches – 50 that light after getting wet! (5) Emergency Candles – Each candle lasts 5 hours! (12) Sanitation/Toilet Bags – Maintains sanitary conditions! (1) Package Toilet Chemicals – Maintains sanitary conditions! (1) Packaged in 5 Gallon Air Tight Container – easy to carry! (1) Roll of Duct Tape – Great for various applications! (1) Emergency Safety Whistle – Attracts rescue attention!